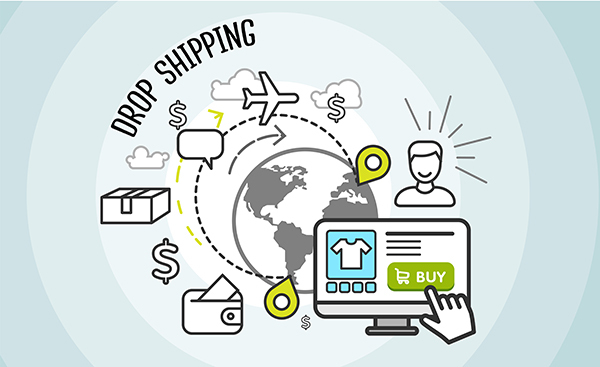 If you’re looking for a business you can run from your office chair or the beach with minimal financial outlay, you might want to consider Dropshipping. When you search for a product, let’s say a Santa Claus costume for your Weimaraner, several sites come up with products. These sites (including Amazon) don’t have a warehouse filled red fur-trimmed get-ups for your lanky, perpetual canine energy machine. Instead, you’re looking at a “retail fulfillment” method that doesn’t stock the products it sells. When that online store sells a product, it purchases the item from a third party and has it shipped directly to the customer. The merchant never sees or handles the product. This means you can get into selling almost any product with no big investment or physical office. Pretty cool, huh? 1. No Capital Required – One of the biggest advantages to dropshipping is that it’s possible to launch an ecommerce store without investing thousands of dollars in inventory up front. Actually, little money at all. 2. Cash Flow Joy – You don’t have to purchase a product unless you already have made the sale and have been paid for it. You buy the Santa Costume with the money from the customer, keeping your markup. 3. Get Started Quick – Running an ecommerce dropshipping business is much easier when you don’t have to deal with physical products. 4. Low Overhead – With dropshipping, your overhead expenses are low. Many successful dropshipping businesses are run from home for less than $100 per month. And, these expenses will still be low as you grow. 5. Freedom – You can run a dropshipping business while you’re laying on the beach in Jamaica sipping on a Pina Colada if you have an internet connection. If you can communicate with suppliers and customers easily, you can run and manage your business. 6. A Wide Product Range – Since don’t have to pre-purchase the things you sell, you can offer a wide range of products to your potential customers. If suppliers stock an item, you can list if for sale on your website at no additional cost. 7. Growth Potential – By leveraging dropshipping suppliers, most of the work to process additional orders is done by the suppliers, allowing you to expand easily. Do you hear a celestial chorus singing? Does it sound like all rainbows and blue skies? Hold it! There is a price to be paid and here it is. 1. Low Margins – People are out there shopping their heads off, but since there many websites, they are looking for the lowest price. You may need to keep prices competitive and sell a large volume of goods. 2. Competition- Since it’s easy to get started and the overhead costs are low “etooties” (ttps://tinyurl.com/y8r8fzb4) will set up shop and sell items at rock-bottom prices. They’ve invested so little they can afford to operate on minuscule margins. 3. Cutthroat Jerks – Sellers with log-quality websites and poor customer service can quickly destroy the profit margin in a niche. 5. Shipping Complexities – The products on your website may be sourced through several different drop shippers. This complicates your shipping costs. 6. Customer Service – If you don’t like helping people, you may not like the customer service element inherent in dropshipping. People will complain. Suppliers will make errors. You need to be willing to take responsibility for things that are not your fault. This is starting to sound like work. I didn’t say dropshipping is a passive side hustle. It’s a business. You must work it and make good decisions. In Part 2 we’ll look at how to pick the right products to sell (probably your most important decision), how much to mark up your products, how to market your business, and more stuff. By Vicki Garcia is the Co-Founder of Operation Vetrepreneur & President of Marketing Impressions, a 30+ -year- old marketing consulting firm. Apply to join Operation Vetrepreneur’s FREE Think Tank Groups at www.veteransinbiz.com or visit www.operationvetrepreneur.vet for more info.